We’d love your help. Let us know what’s wrong with this preview of Four Summoner's Tales by Kelley Armstrong. To ask other readers questions about Four Summoner's Tales, please sign up. Where can I find this novella? Four novellas that all base their plot around raising someone from the dead. Unexpectedly, all four stories are a little dark, a little gruesome. I've read books by Kelley Armstrong and David Liss before and they're the reason I picked up this book. But one of the best aspects of reading these types of compilations is the chance to discover new authors, without committing to a full-length novel. In a 19th century village, all the children have been tr Four novellas that all base their plot around raising someone from the dead. Unexpectedly, all four stories are a little dark, a little gruesome. I've read books by Kelley Armstrong and David Liss before and they're the reason I picked up this book. But one of the best aspects of reading these types of compilations is the chance to discover new authors, without committing to a full-length novel. In a 19th century village, all the children have been tragically struck down by cases of diphtheria. Strangers enter the village with an intriguing promise to raise them back from the dead. As I know Kelley Armstrong from her Women of the Otherworld series -- good but fluffy supernatural romance -- I was incredibly surprised and impressed by this story. She's a fine writer, but no one I took too seriously. There's no fluff here... only blood and steel and darkness. This struck me as a little racist, with the drug lord and his gang being the pictures of absolute evil. He sends men to slaughter a town without any provocation, he dismembers a teenage girl and enjoys it... he is the gold-chain-wearing, cackling cholo of pure evil. The story itself felt flat. While it was unsettling as I read it, none of the details or impact stuck with me. David Liss does a phenomenal job at historic fiction, and even this supernatural-infused look at 17th century England is full of wonderful detail. This story has more of humorous edge then the other three, although it is dark humor. Easily my favorite story in the collection. Jonathan Maberry uses characters from his long-running series in this novella, although it's not necessary to have read one to enjoy the other. His story focuses on a group of special ops soldiers trapped in Afghanistan with a long-forgotten pre-Christian demon. To me, the story read like any other modern war book... there just happened to be a supernatural element thrown in. There's a lot of description of military helicopters and weaponry, a lot of acronyms, a lot of talk of brotherly bonds formed in the heat of combat. Not my cup of tea at all. Oh my, this just super grade A creepy! Though you get at a closer look at what is really going on with the Mexican Cartels, and the people that it immediately affects. Oh wow! Wow, wow, wow, wow! Where the hell do I start? This story is amazing! There is so much to learn from this, and now I'm going to go find more of this writer's work now. Holy freaking crap! I'm definitely going to have my hubby read this one. Not many know that he's a veteran that went to Afghanistan. He told me quite a few odd stories when he got back, and I swear to the gods that when I read this I just about pissed myself when the similarities were so close. Also I would like to know if this unit DMS is for real or merely fictitious? Four strong stories from four great writers. I was initially attracted to Four Summoner’s Tales because Kelley Armstrong is one of my favorite authors. I loved Ms. Armstrong’s urban fantasy series and I always look forward to new books and stories by her. I’ve also read Jonathan Maberry’s young adult zombie series and enjoyed that immensely. So Armstrong and Maberry = Win for me. If the opportunity to reanimate a recently deceased loved one presented itself, what would you do? And at what cost? T Four strong stories from four great writers. If the opportunity to reanimate a recently deceased loved one presented itself, what would you do? And at what cost? This is the theme of Four Summoner’s Tales. I think that what I liked most about this anthology was each author’s very different take on the theme. A small remote town in northern Ontario lost most of its young and aged population from a diphtheria outbreak. The town is offered a chance to resurrect the recently dead children at a huge cost. I loved Preacher and Addie who acted as the town’s conscience. This is a dark story with a little twist. Christopher Golden is a new to me author and from the quality of this story, I will be sure to look up some of his books. I really enjoyed this story about a father’s love for his young teen-aged daughter Savannah. The story ripped my heart out and I really felt the Zeke’s pain, as well as the grief of his small, border town that has been tormented by a Mexican drug cartel. This is quite a dark and brutal story. If you like the historical “romances” complete with rakes and other villains, then this may be the story for you. The Good Natured Man takes place in 18th century London and is the story of a young man with a questionable background who wishes to marry a rich widow. He takes a journal from his father and learns a spell to reanimate the dead. What follows is bribery, trickery, betrayal, death, and general mayhem. This was an enjoyable story and it really touches upon the consequences of changing fate. Well done. I really must read some of Jonathan Maberry’s adult books. Rot & Ruin is a family favorite in my home and now that I’ve read this short story I really want to read more of his Joe Ledger series now. This was probably my favorite story of the anthology. A black ops team is fighting the Taliban in Afghanistan and they come across something strange and deadly. I liked how this story took from the Lilith mythology of the region and expanded on those demons. It was definitely a very creepy and bloody story. All in all, four strong stories by four exceptional writers. Four Summoner’s Tales was an enjoyable read. Thank you to Edelweiss and Gallery Books for a review copy of this book. My review below is solely based on having read Kelley Armstrong's Suffer the Children in this anthology. Frankly, I didn't know the other three authors and I really wanted to read this book because of Ms. Armstrong. So there you go, that was my confession upfront. In Suffer the Children, we were treated to a story unfolding in a remote town somewhere near Toronto (Canada, I assumed), the people had an epidemic of diphtheria and 36 people had died of this disease, most of whom were children. When t My review below is solely based on having read Kelley Armstrong's Suffer the Children in this anthology. In Suffer the Children, we were treated to a story unfolding in a remote town somewhere near Toronto (Canada, I assumed), the people had an epidemic of diphtheria and 36 people had died of this disease, most of whom were children. When two strangers rode into town, claiming to have the ability to raise the dead, Benjamin (the Preacher of the town) objected vehemently but was rejected by the town's other council members they all were grieving lost loved ones and these strangers had given them hope. Nothing was easy and was never as it appeared. Raising the dead had a terrible price and these townsfolks had no idea what they were getting themselves into when they signed up to this. Ms. Armstrong never ceased to amaze me with her writing. Despite the short length of the story, she managed to pack a tale that held me to the edge of my seat and write various different characters with such vivid and distinct personalities. It really showed the depth of human's values and conscience when faced with an impossibility (i.e. the resurrection of a loved one) through that person's reactions and behaviours. Some people held their beliefs firm while others faltered under hope and external influence. It was truly a sad story and it had no happy ending for everyone that was involved - well, perhaps the only person that was "happy" in the end would be the villain! I really liked this! This was a strong anthology. I liked all of the stories. I think it was cool how they all created a story based on the same premise, and how that same premise can go in so many different directions. I also liked how it was four novellas, how I got a more fleshed out story than a short story would have given me. This was great. My favorite story was probably Kelley Armstrong's story, it was suuuuper dark. This was a win for me. Story #1: Suffer the Children by Kelley Armstrong -- 4.5/5 -- Really good. Really dark. My favorite of the anthology. Story #2: Pipers by Christopher Golden -- 4/5 -- I enjoyed this one a lot too. It focused on a tragedy, grief, and revenge. Story #3: A Bad Season For Necromancy by David Liss -- 4/5 -- This one was a little slow at first, took a little longer for me to get into, but I did like it. I liked how our main character was a charlatan and a rogue doing things to make a buck. I liked how it twisted the premise a little. Story #4: Alive Day by Jonathan Maberry -- 3.5/5 -- This was probably my least favorite of the anthology, but I still liked it. This takes the already established character Joe Ledger who is member of a super secret, super tough, military unit. So this story was very military, which I don't really read a lot of. Although, I have read the first book in the Joe Ledger series, and I do enjoy it and plan to read more of it. I feel like this one felt the most loose with the premise, if that makes sense. It was about a mission in Afghanistan involving tips of a biological pathogen, but turns into something much different, much darker. I did like it. Overall, this Anthology is a win. It was a really fun read. Tales by 4 authors with one theme: Raising the dead. Ah, but what’s the price and what exactly will be raised? I read this as an eBook ARC, but each story appears to be 80-90 printed pages long, giving enough world and character building, emotion and a sense of horror (for one reason or another) that you won’t feel like you’ve been short-changed. I read this because of Kelley Armstrong and am new to the other authors. I found that I enjoyed all of the stories and am looking forward to checking o Tales by 4 authors with one theme: Raising the dead. Ah, but what’s the price and what exactly will be raised? I read this as an eBook ARC, but each story appears to be 80-90 printed pages long, giving enough world and character building, emotion and a sense of horror (for one reason or another) that you won’t feel like you’ve been short-changed. I read this because of Kelley Armstrong and am new to the other authors. I found that I enjoyed all of the stories and am looking forward to checking out books by the other three authors. I believe the first 3 are stand-alone stories. The last one by Jonathan Maberry is part of his Joe Ledger series, although you don’t have to be familiar with those books to get into this one. I’ve read plenty of Urban Fantasy, and books containing necromancy, but these stories felt a lot creepier than the other things I’ve read. Suffer the Children by Kelley Armstrong is set in the past in a small wilderness town in Canada. Over 1/3 of the population was just wiped out by diphtheria; a great many of them children. Two men walk into town; speaking to just the town council they offer to help by raising any that passed in the last 4 days. But after luring them in with hope, tell them just a portion of the real price. Part of the story is told thru the eyes of a wild 12 year-old girl who finally learns what love of family means. This story felt the most horrific in terms of what people are willing to do. Pipers by Christopher Golden is set in Lansdale, TX along the Mexican border and is told through the eyes of Zeke. His daughter, along with 22 other people, is gunned down at a town celebration by the Matamoros cartel in retaliation for the disruption of their drug trafficking operation. Months later a man shows up offering to return their loved ones to them, but it’s an all or nothing proposition and getting vengeance is part of the package. What we get out of this story is the heavy emphasis on morality that not only is Zeke struggling with, but most of the other people involved. But once started they can’t back out. The results take a surprising turn. This story hit my emotions the hardest. A Bad Season for Necromancy by David Liss is set in England in the early 1700s as we follow an acknowledged rogue and scam artist conning his way into the ton in order to snag a rich bride. He comes across a book telling him how to raise the dead and in a fit of anger, uses it to hurt someone. I loved the writing style of this author that gave a humorous slant to a number of things even though it was said in a straight way; reminded me of the way comedian Bob Newhart tells a story. And I was surprised to find that I not only liked the scoundrel but was rooting him on. Alive Day by Jonathan Maberry is part of the Joe Ledger series. Echo Team is sent into Afghanistan to back-up Snake Team who is trying to take out the Taliban’s drug trade. But Snake Team ran into trouble with an old spirit and a bargain is made to save the leader’s team. This one is obviously military-based and is probably the most horrific in terms of what each of the men face, and unless you witness it, no one is going to believe you. Chilling. This story is heartbreaking and tragic as it demonstrates just how far a town of people are willing to go to save their children. It was shocking how gruesome the story became when the price for raising the townsfolks’ loved ones was. While this story was filled with darkness and blood it had a bittersweet ending for Addie and her foster mother. Set in 18th century England we follow a scam artist who gets his hands on a book that teaches him how to raise the dead. What follows is a long string of death, reanimation followed by more death, betrayal, and mayhem. I enjoyed the writing style and dark humor in this story. PIPERS was really gruesome with the dead being used as revenge. Like SUFFER THE CHILDREN, PIPERS was about the length a father would go to see his child again even though the consequences of reanimation bring up serious issues of morality. I enjoyed the mix of zombies with Mexican drug cartels; two things I never think to put together and it ends up as horrifyingly blood as a zombie vs drug cartel battle would end. I also liked the little twist at the end which didn’t see coming. Four short stories of horror revolving around the basic plot of someone offering to raise the dead...for a price. All four were horrorific in varying degrees. And all four were well written as complete stories with backgrounds and developed characters. Kelley Armstrong’s “Suffer the Children” is a nasty bit of complex betrayal in a small village outside Ontario in the nineteenth century, and I cried so at the end. Christopher Golden’s “Piper Four short stories of horror revolving around the basic plot of someone offering to raise the dead...for a price. Christopher Golden’s “Pipers” was the most depressing as events fall apart around the townsfolk. People who mostly hoped to bring back their loved ones, but were pushed and blackmailed into continuing with a deadly plan. David Liss’s “A Bad Season for Necromancy” was my least favorite as the “hero” was such a weak man who preyed on others for his own advancement. Although Liss did provide for this aspect of Reginald/January with the effects of being revived. Jonathan Maberry’s “Alive Day” is the most horrific, partially because Maberry leaves so much to my confused imagination, and partially because he was so brilliant in pulling me into the terror of what happened to Finn in Afghanistan. The cover is actually not so scary with its behatted man in a leather coat, his back to us as he stands in the rain in the middle of a cemetery. This review is about Kelley Armstrong's "Suffer the Children" only. I picked this up just for her story. I liked the idea behind the novella (each author had to write a story based on this: "A strange visitor comes to town, offering to raise the townsfolk's dearly departed from the dead- for a price..."). Story is in 3rd person throughout, but there are segments told through Addie, Preacher (Benjamin), and Browning's point-of-view. I enjoyed that because it let me understand things from that par This review is about Kelley Armstrong's "Suffer the Children" only. I picked this up just for her story. I liked the idea behind the novella (each author had to write a story based on this: "A strange visitor comes to town, offering to raise the townsfolk's dearly departed from the dead- for a price..."). Story is in 3rd person throughout, but there are segments told through Addie, Preacher (Benjamin), and Browning's point-of-view. I enjoyed that because it let me understand things from that particular point of view. I think this is unlike anything she has ever written. Very dark, wonderfully so. All good, solid stories, but I think I enjoyed the first most of all. Kelley Armstrong's tale really made me live in her world. And, of course, the Joe Ledger tale is awesome. I initially bought this book because Kelley Armstrong is one of my top three favourite authors. After reading her novella, which was darker than most of her other books and short stories, I was completely hooked on the premise of this collection. I felt that "Pipers" had a heart wrenching and unique approach to the premise, however the ending felt rushed and somewhat unsatisfying. When I started reading David Liss' novella, I was initially skeptical that I would enjoy his story. However it quick I initially bought this book because Kelley Armstrong is one of my top three favourite authors. After reading her novella, which was darker than most of her other books and short stories, I was completely hooked on the premise of this collection. When I started reading David Liss' novella, I was initially skeptical that I would enjoy his story. However it quickly grabbed me and I was unable to put it down. I especially loved his twist on the agreed parameters of the novella. Moral of these tales - be careful what you wish for. Excellent idea - four novellas, each written based on a single idea, exploring the horror of returning from the dead. How novel! I enjoyed this story by Kelley Armstrong. I am a fan of her Otherworld series but my love for her work does mostly stop there, so it's easier for me to be objective about these kinds of novellas. I read this novella as part of Four Summoners Tales, a collection of similar stories. And it was pretty good actually. Set aside from any of her other worlds, this short story features Addie. A young girl orphaned in her village and taken in by a non-believing Preacher and his wife. The town has recentl I enjoyed this story by Kelley Armstrong. I am a fan of her Otherworld series but my love for her work does mostly stop there, so it's easier for me to be objective about these kinds of novellas. I read this novella as part of Four Summoners Tales, a collection of similar stories. And it was pretty good actually. Set aside from any of her other worlds, this short story features Addie. A young girl orphaned in her village and taken in by a non-believing Preacher and his wife. The town has recently had a series of misfortunes, namely Dyptheria, which has wiped out all of the young or frail. So when two men enter the town claiming to be able to resurrect the dead, the villagers jump at the chance. At any cost. I liked the pace of this story. It's not too short so the world building is fairly good whilst the story moves quickly still. The characters are a little one dimensional as the story is split two, or even three, ways sometimes within the narrative. I enjoyed the plot although suspected the ending before it was revealed. It's definitely an interesting take on resurrection, although unoriginal, and I liked how Armstrong explored the human reactions with loss. For example, a few scenes show how far people will go during grief or for the dead. I also really enjoyed how honest she made the villagers, one man had no shame in admitting he'd gladly swap his wife for his child. This kind of ugly but honest writing really grabs me as a reader. Overall a good story that I'd recommend as part of the Four Summoners Tales. I expected this to be better because I've loved some of the featured authors work before. And it is pretty good, but it's not the kind of book you'll find yourself reading long into the night. This collection features four short stories following a similar theme: Resurrection. And actually they each have a different take on it but with similar questions about how far you'd go to resurrect someone you love. It's definitely a thought provoking collection. Suffer The Children by Kelley Armstrong:- This is set in a world entirely separate from any of her other series and isn't paranormal especially which fans of her writing may not expect. It centres around Addie, a recently orphaned girl who is taken in by a Preacher, who doesn't really believe, and his wife. The village has recently been plagued with Dyptheria so the young and frail have died. The villagers are understandably stricken until a new guy in town says he can bring them back to life. For a price. This is an interesting story with a fast pace and some surprises. It's not especially original and the take on resurrection isn't too exciting, but it's told very well and kept me interested. I especially enjoyed the honesty of the villagers when they express how far they'd go for their loved ones. This ugly honesty was really gripping. 3/5. Pipers by Christopher Golden: Following a similar theme as Armstrong's story. Zeke has recently lost his wife to cancer. So imagine his distress when his daughter is then brutally murdered at the hands of a Mexican cartel. Hell bent on revenge he seeks to resurrect his daughter with others suffering the same loss to kill the cartel and get his daughter back. This moves slowly and became kind of boring, but actually poses some interesting questions about life and death. I especially liked this authors take on being Alive versus actually living. 3/5. A Bad Season For Necromancy by David Liss. This was a well written story offering the opposite take on resurrection - how far would you go to stop resurrection? I liked the implications of the main characters beliefs and opinions but it was such a slow read that I almost lost interest. Stick with it for some interesting ideas, but not for those readers who need to dragged into the story full force from the very beginning. 2/5. Alive Day by Jonathan Maberry. Set in the same world as his Joe Ledger series, this story watches Echo Team go on a search and rescue mission for another squad lost in the desert. There are some interesting paranormal twists here that I didn't expect at all and really liked. You absolutely don't need to have read this larger series to enjoy it, although I think if you have you might appreciate some of the back story a little more. For fans, this isn't quite as good as you'd expect from Maberry, but it's a nice extra bit of Ledger before the next book comes out. 4/5. This review has been hidden because it contains spoilers. To view it, click here. A short but interesting summary (along with the cover that said Kelley Armstrong wrote a story in here) that hooked me into getting this book and overall I would say it was an...Interesting experiance. Starting of with the first story by Kelley Armstrong, "Suffer the Children" a little girl (Addie) is adopted by a preacher and his wife in a small town which is suffering from a disease that kills all the young and old. Addie is one of the only surviving children and most of the people in town are A short but interesting summary (along with the cover that said Kelley Armstrong wrote a story in here) that hooked me into getting this book and overall I would say it was an...Interesting experiance. Starting of with the first story by Kelley Armstrong, "Suffer the Children" a little girl (Addie) is adopted by a preacher and his wife in a small town which is suffering from a disease that kills all the young and old. Addie is one of the only surviving children and most of the people in town are jealous and angry that she lives while thier children do not. I give this story a 3 star rating because it was typically what I imagined the stories would be like. However, you really start to love Addie and the Preacher as the story switches between thier POV and see the madness that the town feels with the loss of thier children. In the end when the revived children start to kill the townsfolk, you feel a sort of sick and dark satisfaction when they die along with Addie when you see how terrible the towns people are. Making for a satisfying end. In the next story, "Pipers," by Christopher Golden I would only give a 2 star rating. In the beginning a father and daughter are driving to a festival and are chatting along the way. We find out the mother has died of breast cancer and the father is learning to cope with the loss. There is alot of emotion in the first few pages and at first you feel really bad for Zeke (the father) as he describes his emotions towards his two most loved girls. But as time goes on you stop feeling bad for him see more of a man who just seems to pity himself. I got bored less than half-way through and feel no emotion when the daughter dies, hoping it would get better when the necromancer came. It did, but only slightly. When he came the story got darker with his madness, it became more interesting, especially when he find out that he was not human. In the end when Zeke dies and gets revived by his daughter, it was a sort of sad-yet happy ending. "A Bad Season for Necromany" by David Liss was an interesting take on the line and so given a 3 star rating. It takes place in 1713, where money and status means everything. The main character is a poor thief who has an abusive father who drinks and whores like no tomorrow. Reginald (the main chcracter) takes all his dad's money and leaves while the father is drunk. Deciding he wants a life of leasure he starts to worm his way into a rich, widow's heart but falls for her while doing so. I like the story because Reginald is sort of like an antihero, and it was interesting to be inside his mind as he finds ways to make money. I thought it was both clever and cruel the way he used his act of necromancy to get the money he wanted. As well as a dark enjoyment when the abusive husband is tortured in the ways that he was. Especially in the end where he got exactly what he threatened to do to Reginald. But, like in "Pipers" I could not get into the story. Althought, this time it was because the story seemed very platonic and there was little to any emotion at all which made the events in the story not as interesting as it could have been. "Alice Day" by Johnathan Maberry is my favourite of the four and got a 4 star rating. The POV is divded inbetween two military operative teams. The first team is lead by Finn, who at first we think is dead- hearing screams of his men that seem to go on forever and the ugly laughter of something...Not human. However, we find out that he isn't dead but the rest of his team (which has three other people) is. Feeling guilty he wishes he could re-do what happened and is given the chance. The second team is a rescue team for Finn's team lead by Captain who sees that three of the four life signals are weak and would dissapear one moment and appear somewhere completely different on a map. I whipped through this story so fast because of how interested I was in it. Half the time I think I will understand something and then be proven wrong a second later. It was a fasinating story as it was creepy and it was a completely unique take on the stranger and necromancy. I truly had no idea what was going to happen and the end was just as creepy and interesting as the rest of the story. The only fault I can think of that lowered the rating was that some parts of the story seemed to have no relevence that I could see. For example, the part where Finn meets Aziz who gives us barely any information and could have been given by someone of more importance like Bug. As you guys know, I'm not the hugest fan of anthologies, but I absolutely love Kelley Armstrong's work. Therefore, I decided to give this book a try. Unfortunately, Armstrong wasn't enough to save this collection, and even her story fell flat. This book isn't bad, but it isn't the best set of stories I've ever read either. Furthermore, I thought this was a collection of Dystopian stories, but none of the stories really fit the genre, which left me confused. I say read this only if you adore anth As you guys know, I'm not the hugest fan of anthologies, but I absolutely love Kelley Armstrong's work. Therefore, I decided to give this book a try. Unfortunately, Armstrong wasn't enough to save this collection, and even her story fell flat. This book isn't bad, but it isn't the best set of stories I've ever read either. Furthermore, I thought this was a collection of Dystopian stories, but none of the stories really fit the genre, which left me confused. I say read this only if you adore anthologies. Otherwise, if you want to sample these authors' works, I'd recommend just getting one of their books from the library or book store. Armstrong disappointed in this novel, and "Suffer the Children" fell extremely flat for me. Armstrong's voice was off. Yes, the circumstances were horrifying, and hearing the story from a 12 year old girl's perspective was upsetting. However, Armstrong displayed the dangers of writing about indigenous populations from a settler's perspective. The girl came across as so primitive and ignorant that it was extremely insulting to First Nations' peoples. I was terribly disappointed by this. I don't think that was her intent, but I really wish non-native people would leave indigenous peoples alone. Don't write about what you don't understand, and for the love of all that's good in the world, don't think you can possibly understand what being a member of a colonized people entails simply from reading a few books and doing a little research. If you don't live with them for years, then you can't understand, so just leave it alone. All this story did was perpetuate the already inaccurate myth that First Nations peoples are and always have been intellectually inferior to the settler. I don't think Armstrong did this purposefully because in the past she's treated indigenous peoples with the utmost respect, but that doesn't make the repercussions any less real. Out of all of the stories, I think that David Liss had the best voice with his story, "A Bad Season for Necromancy." I loved the time period in which this one was written, and the world-building was fantastic, especially since he had such a limited amount of space in which to work. The characterization was also top notch. The characters feel real and fully developed, which again, is difficult to do within the short amount of space allotted each story. Furthermore, Liss was able to make you root for a character of questionable morals. That takes talent. I think I will have to check out Liss' other work. The other stories didn't stand out to me that much, but none were as big of a disappointment as Armstrong's story. "Pipers" by Christopher Golden really didn't seem "dystopian." In fact, it seemed to reflect what goes on daily in our society; therefore, it also didn't fit with the supposed theme of the book. The more that I think about it, the more that I think that the theme of the book is that humans are monsters and morality is important. The story, like a couple of the others, has good lessons about morality, though, and it will tug at your heart strings. Like the other stories, "Alive Day" by Jonathan Maberry was pretty horrifying. However, I really am not a fan of military-based themes. Therefore, I didn't exactly enjoy this story. His writing was just fine, and the plot would have been intriguing if I enjoyed military fiction. Yes, I enjoyed Band of Brothers, but it was a historic book, not fiction. I never can seem to like military-themed fiction. Either way, this was an issue of personal taste, not anything the writer did wrong. I'm going to be honest and say that I'm not big on anthologies. In fact, I tend to avoid them unless there is an author I absolutely love in it. So when I saw that Jonathan Maberry wrote a story in Four Summoner's Tales , I snagged this bad boy up! What often happens on the rare occasions I do read an anthology, I read one or maybe two stories from it - obviously one being the author I love. However, I decided to give the other three stories in this book a try because I've heard positive things I'm going to be honest and say that I'm not big on anthologies. In fact, I tend to avoid them unless there is an author I absolutely love in it. So when I saw that Jonathan Maberry wrote a story in Four Summoner's Tales , I snagged this bad boy up! What often happens on the rare occasions I do read an anthology, I read one or maybe two stories from it - obviously one being the author I love. However, I decided to give the other three stories in this book a try because I've heard positive things about them. They all turned out to be good, but some more than others. I really like the idea behind this book. Four authors are set loose to write their own story, but they all start with the same premise: A stranger comes to town, offering to raise the townsfolk’s dearly departed from the dead—for a price. Necromancy? Heck yeah! I was very curious and excited to see how each author was going to build on that. I'm not going to do much summarizing of the individual stories since the blurb does a sufficient job. The first story is Suffer the Children by Kelly Armstrong. Even though I've wanted to read something by Kelly for quite awhile now, I never got around to it. I was a little hesitant for a novella size story to be my introduction to her writing, but she totally impressed me! In fact, it turned out to be my favorite of the four. Even though I found parts of it fairly predictable, the ending surprised me. This has definitely encouraged me to read another book by her. My second favorite was A Bad Season for Necromancy by David Liss. Truthfully, I considered not finishing it two pages in, but I think it had more to do with the mood I was in. Once I pushed myself through, I discovered a dark and gritty story that made me do a complete 180. I quite enjoyed this tale of necromantic extortion, even the attempted necrophilia (that sounds bad - haha). It's the most mature of the four stories, that's for sure. Alive Day by Jonathan Maberry was third on my enjoyability (it that a word?) list. I love Maberry's Joe Ledger series, so I was ecstatic that this story centers around the same main character and the fact that you don't have to be familiar with the series to read Alive Day. I know, this was the reason I got this book in the first place, so it should be higher up. I did enjoy this story and thought it was interesting, but ... I just wasn't completely feeling it. I hope other people don't judge the Joe Ledger series based on this, because I don't think it was a great representation. Unless they like it. Then judge away! And lately is Pipers by Christopher Golden. I had mixed feelings about this one. The writing was good, but I wasn't a fan of most of the story. I felt that the drug cartel scene was more laughable than scary ... or whatever it was meant to be. It had its moments, though. Overall, I liked Four Summoner's Tales and learned a lesson from reading it: read all of the stories in an anthology! I would have missed out if I had only read Maberry's story like I originally planned. Suffer the Children by Kelley Armstrong was good. A Bad Season for Necromancy by David Liss was a bit odd, but overall I liked it. Pipers by Christopher Golden was a bit strange, because it felt at the ending like it was supposed to be horror, but it didn't feel horrific. The violence was gory and scary. Alive Day by Jonathan Maberry was nicely creepy. My favorites were probably Suffer the Children and Alive Day. Anthologies generally have a common thematic thread (witches, werewolves, unicorns vs zombies...), but this one is a little more complex than most. Each author was given an inspirational sentence: "A strange visitor comes to town, offering to raise the townsfolk's dearly departed from the dead--for a price..." Armstrong is the only contributor with whom I was familiar, but all four authors spun a satisfying tale, another rarity in the world of anthologies. Each ran with the theme in different wa Anthologies generally have a common thematic thread (witches, werewolves, unicorns vs zombies...), but this one is a little more complex than most. Each author was given an inspirational sentence: "A strange visitor comes to town, offering to raise the townsfolk's dearly departed from the dead--for a price..." Armstrong is the only contributor with whom I was familiar, but all four authors spun a satisfying tale, another rarity in the world of anthologies. Each ran with the theme in different ways, with Armstrong's being the most compliant with the type of story I would expect to get given that inspiration. Her 19th century rural Canadian setting was perfect for a story that literally involved two strangers walking into town and offering to revive a group of townsfolk who'd recently died of a diphtheria outbreak. The means by which the dead were raised made sense, as did the motivations and outcomes. It was a fully realized story that fit well in the novella format, with no unanswered questions or extraneous content. Golden's was also a pretty literal interpretation of the theme, but brought forward to current time. After a group of residents of a Texas border town are gunned down by a Mexican drug cartel, a necromancer shows up and offers to restore their loved ones if they'll use them to bring down the cartel that also murdered his daughter. It's a pretty straight forward concept and he dealt well with the emotional blowback of making such a decision. I'm not sure I totally loved the ending, exactly, but it worked. Liss's execution was a little more liberal--while it did technically involve a stranger offering to raise the dead for a price (or not raise them, as the case may be), the "stranger" was actually the narrator and the story had much more to do with how he came into this mysterious power than it did the offer itself. It did, however, paint a pretty vivid portrait of how such a decision could affect the magician himself, and watching him get out of his predicament was just as, if not more, entertaining than seeing him get into it in the first place. Told in first person, Liss did a good job with the language of the narration to really give you a sense of following an 18th century English con man on this journey of discovery, but at times the intentional vagueness of the narrator read more as authorial conceit than as character-establishing dialogue. I was thrilled to have the opportunity to read and review Four Summoner's Tales, and I found it to be an enjoyable read. Prior to reading this anthology, I was only familiar with Armstrong's writing which is the reason the anthology appealed to me in the first place. However I tend to favor reading anthologies as a chance to "meet" new authors, and this set of tales does a great job at giving the reader a glimpse of some great storytelling. Armstrong's "Suffer the Children" does what I have come I was thrilled to have the opportunity to read and review Four Summoner's Tales, and I found it to be an enjoyable read. Prior to reading this anthology, I was only familiar with Armstrong's writing which is the reason the anthology appealed to me in the first place. However I tend to favor reading anthologies as a chance to "meet" new authors, and this set of tales does a great job at giving the reader a glimpse of some great storytelling. Armstrong's "Suffer the Children" does what I have come to expect from her work with great character development, a suspenseful tale, a writing style that really draws the reader in, and an entertaining read. Golden's "Pipers" delivered a compelling tale that begins with the heartbreak of loss that turns into the thread of hope and then into a nightmare. Golden does a great job at tugging at the heartstrings making you feel his characters’ pain and justifies their actions with their hope of being reunited with their loved ones. I really enjoyed his writing style and his ability to draw the reader in. Liss’s “A Bad Season for Necromancy" also proved to be a chilling tale that unlike the two previous tales gives a glimpse into the summoner rather than the person being affected by the summoning. Making his main character not your typical hero but rather a con man out for himself was an interesting take. Liss does a great job at developing his main character and giving the reader his motivations as he tries to con the woman he loves. When that turns bad, Liss does a great job at surprising the reader with another twist of events. I really loved how Liss continues to surprise the reader until the story's chilling conclusion. I have to admit that Maberry's "Alive Day” was the one story I struggled with. It said at the beginning that these characters were from his previous works but that previous knowledge wasn't needed to enjoy this story. The story was good and entertaining, but I didn't get the character development from this one like the other three works. I personally didn't get the same connection to these characters as I did from the other stories, but overall I did enjoy his story. The entire anthology was a really enjoyable read that I would most definitely recommend. I loved the overall theme of a summoner and the effects of what can happen, and I think each author did a great job at providing an entertaining tale. One prompt, four authors, four very different stories. 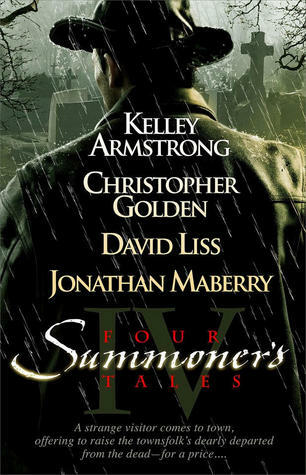 This is the concept behind FOUR SUMMONER'S TALES a collection of novellas featuring Kelly Armstrong, Christopher Golden, David Liss, and Jonathan Maberry. According to the intro, Golden and Maberry conceived of the idea over dinner one evening. Their prompt was just one sentence: A strange visitor comes to town, offering to raise the townsfolk's dearly departed from the dead - for a price. With that in mind, they chose two additional authors One prompt, four authors, four very different stories. This is the concept behind FOUR SUMMONER'S TALES a collection of novellas featuring Kelly Armstrong, Christopher Golden, David Liss, and Jonathan Maberry. According to the intro, Golden and Maberry conceived of the idea over dinner one evening. Their prompt was just one sentence: A strange visitor comes to town, offering to raise the townsfolk's dearly departed from the dead - for a price. With that in mind, they chose two additional authors and all set out to create their own tales. In Armstrong's "Suffer the Children" a town devastated by a diphtheria outbreak welcomes a man who claims to be able to raise their children from the dead. But of course it comes at a price. Addie and her foster family are certain that this is no miracle and must discover the truth before the town is too far gone. Golden's "Pipers" a small Texas town has seen unimaginable tragedy: over twenty people gunned down in an increasingly escalating war with a Mexican drug cartel. Enoch has come to offer them a new option. He can bring back their dead, and with their help, bring down the cartel. In Liss's "A Bad Season for Necromancy" In eighteenth-century England, a man has a plan to get out from under his father's thumb. He kills his father, steals his little bit of money, and moves to the city where he now calls himself January. Here is plans to find a wealthy wife and leave his past behind. But his ghosts aren't so happy to be left behind and his plan is ruinously revealed. When he discovers a book that will allow him to raise the dead, he thinks that surely all his problems will disappear. He's greatly mistaken. His troubles have only just begun. And finally Maberry's "Alive Day" features Captain Joe Ledger on a mission to recover a lost team of soldiers in Afghanistan. The team, codenamed Rattlesnake, went dark while attempting to stop a group of drug traffickers said to be moving more than just opium. Rattlesnake ended up running into something much worse than terrorists, but it isn't until his own team arrives to investigate that Ledger begins to understand. I'm sure this is not a unique concept, an anthology illustrating exactly how four different writers can take the exact same idea and come up with radically different stories. In this case, the writers were given the sentence, "A stranger comes to town, offering to raise the townsfolk’s dearly departed from the dead—for a price." I picked it up because of Kelley Armstrong, and really, her novella was my favorite of the four. It wasn't recognizable from any of her worlds, so a pure standalone story I'm sure this is not a unique concept, an anthology illustrating exactly how four different writers can take the exact same idea and come up with radically different stories. In this case, the writers were given the sentence, "A stranger comes to town, offering to raise the townsfolk’s dearly departed from the dead—for a price." I picked it up because of Kelley Armstrong, and really, her novella was my favorite of the four. It wasn't recognizable from any of her worlds, so a pure standalone story about possession that was seriously creepy. I did find myself playing devil's advocate to both sides, the preacher's and the town's folk, which made the story even more compelling. David Liss' eighteenth century British tale was interesting, at least from my perspective, because so many of the books I read from that era are by women and are romance novels, so it turned that image on it's head. Parts were disturbing and the narrator's voice was so twisted I never knew what to expect. The end confused me a bit, detracting from my enjoyment (as did some of the more visceral descriptions) (view spoiler)[I wasn't sure if it was his love's husband or his father in the home - and the end seemed too simple (hide spoiler)]. Christopher Golden's Texas border town had some creepy moments, but I spent too much time speculating about how the magic worked and trying to poke holes in the logic to truly enjoy it. The end didn't really make enough sense for me. So what do you get when you give four authors the following sentence? "A strange visitor comes to town, offering to raise the townsfolk's dearly departed from the dead-for a price." You get Four Summoner's Tales, an anthology. This is what authors Christopher Golden and Jonathan Maberry did. They met in July 2011 and were discussing ideas for about plots. It was determined that there are only about seven different plots but it all comes down to...execution. Every person has their own idea about th So what do you get when you give four authors the following sentence? You get Four Summoner's Tales, an anthology. This is what authors Christopher Golden and Jonathan Maberry did. They met in July 2011 and were discussing ideas for about plots. It was determined that there are only about seven different plots but it all comes down to...execution. Every person has their own idea about the execution of the story. So why not test that out and see what the results are. The above sentence was given to Mr. Golden, Mr. Maberry and their two fellow authors, Kelly Armstrong and David Liss. They had free rein to whatever concept they wanted in achieving the execution of the story that fit within the parameters of the sentence that they were presented with. Each author came up with their own unique twist on the execution. Four novella length tales with the same premise. Anthologies are a great opportunity to discover writers. The reader gets a sense of their individual style and creativity. In essence it is like eating chocolates with unknown soft centres. You never know what you might bite into. This story questions how far a person is willing to go to bring a loved one back from the dead. Is it worth any price or repercussion? This venture into horror was a little on the wea Four novella length tales with the same premise. This story questions how far a person is willing to go to bring a loved one back from the dead. Is it worth any price or repercussion? This venture into horror was a little on the weak side. Armstrong is a strong UF writer, so I was surprised that her usual depth and talent wasn't as evident in this case. A story of revenge and grief. Once again the readers is asked to reflect upon the lengths a person might take to retrieve a person they have lost. The element of mass or group persuasion during the decision making is interesting. The odd ode to the Hamelin Piper in connection with necromancy was an extremely clever idea. I have to say there were parts of this story that I found more than just creepy. They were borderline over the top, hints of sadistic violence and necrophilia. This is the story that I felt was the darkest in terms of unsettling. Is part of or an add-on to the Joe Ledger series by Maberry. It connects the dark secrets of occults and demons with the world of military warfare. In combat men are unaware of the dangers that may lurk behind each shadow and in that sense the author has combined his summoning to reflect the reality of war, the subconscious fears and the parallels to the unknown dark forces. I received a free copy of this book from Net Galley in exchange for a review - it was Armstrong and Maberry that tempted me into requesting this book so I was surprised when I had trouble getting into Maberry's story, Alive Day, which is based on a series featuring his character Captain Joe Ledger. I've stumbled across a few of Maberry's short stories and have enjoyed them; I was excited for the opportunity to be introduced to this series, which turned out to be very militaristic - a paranormal I received a free copy of this book from Net Galley in exchange for a review - it was Armstrong and Maberry that tempted me into requesting this book so I was surprised when I had trouble getting into Maberry's story, Alive Day, which is based on a series featuring his character Captain Joe Ledger. I've stumbled across a few of Maberry's short stories and have enjoyed them; I was excited for the opportunity to be introduced to this series, which turned out to be very militaristic - a paranormal government/spy thriller. The story was well-written but it's not my usual cup of tea. I expected to like Kelley Armstrong's story because I'm a fan of her paranormal/urban romances. Suffer the Children was my favorite story in this collection, simply because it was much darker than she usually writes. I enjoyed seeing her break the usual mold - she did morbid very well. David Liss's story, A Bad Season for Necromancy, is my second favorite story. I loved the narration and will be checking out more of Liss' work. Christopher Golden's story, Pipers, threw zombies into the world of drug cartel, which was a nice break from the traditional zombie themes we all know so well, but the ending was predictable.